The durable, highly-portable M16 Double Flashbang Pouch from Voodoo Tactical offers storage for two flashbangs, opening-up valuable tactical options in crowd control or dynamic entry situations. Convenient, side-release buckles protect and retain contents while allowing for rapid, one-handed access. 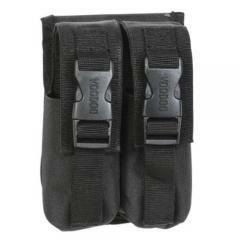 Additionally, the flexible strap material adjusts to fit different sizes of flashbangs. An internal spoon guide keeps contents securely in place and prevents unintentional rotation inside the holster. The pouch fastens to traditional universal webbing platforms, such as packs, belts, vests, chest rigs and other tactical gear and accessories.